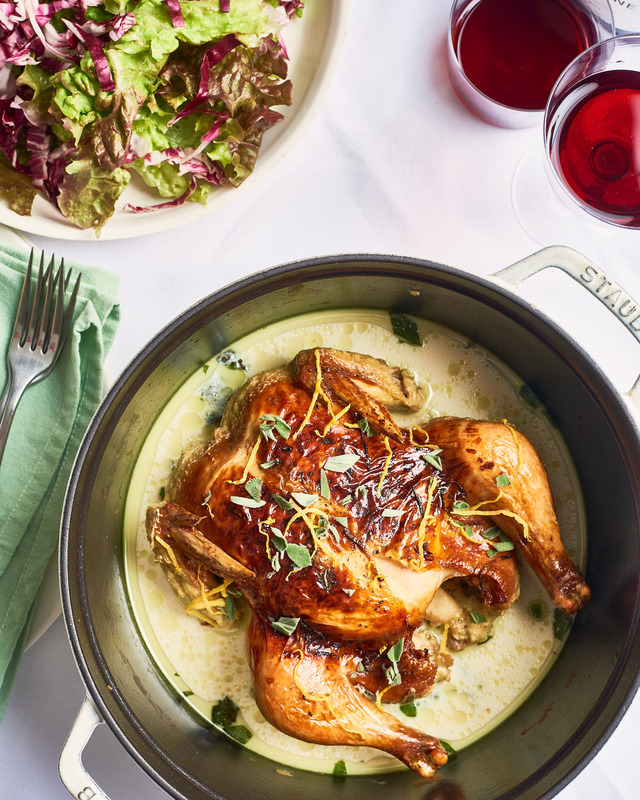 This month we鈥檝e been cooking our way through Chicken Champions, our playful quest to crown the best-of-the-best chicken recipes we think everyone should know by heart: chicken soup, pot pie, roast chicken, and (last but certainly not least!) one superb dinner party showstopper. Everyone is in need of a fancy dinner party showstopper, right? It鈥檚 the recipe for when there is an occasion, and you must rise. It鈥檚 the recipe that lets you swagger into dinner with the in-laws and sleep well the night before. It鈥檚 the recipe to remind you of the very good taste you possess, so own it. 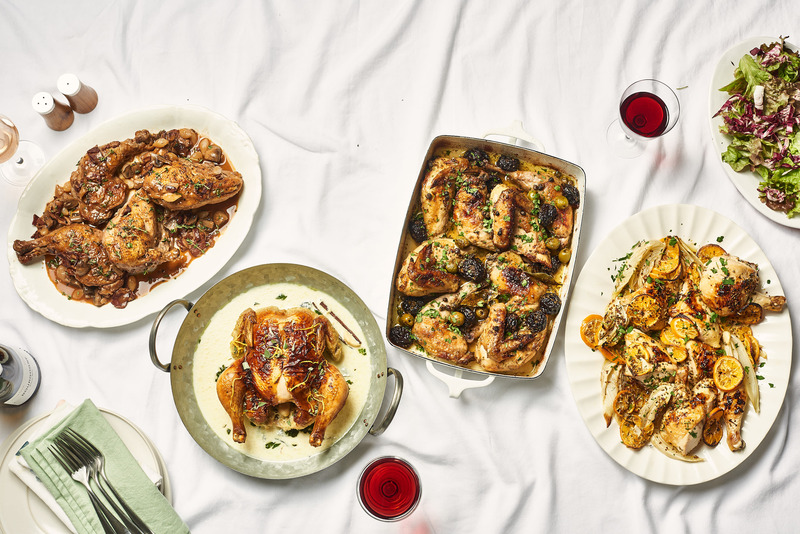 And, if you eat meat, I feel pretty strongly that at least one of your dinner party showstoppers should involve chicken. Chicken is easy; chicken is relatively cheap. Chicken is comfort; you just have to dress it up a bit. Choosing fancy chicken showstoppers, on the other hand, is riddled with subjectivity and an existential whimsy. I was constrained by sheer time and space, and to keep at least a fig leaf of consistency I stuck with relatively Western-centric recipes (no Hainanese chicken and rice to my sadness; next time let鈥檚 all spend a month on chicken and rice around the world, OK?). In the end, we decided that a showstopper needs to be impressive but not overly risky in taste or technique; it needs to be suitable for a crowd but also boast bit of swagger. But ultimately, it needed to have a story and a flair that transcended pure popular numbers. First up, Julia Child 鈥� the great, classic, coq au vin: chicken in red wine with teeny tiny perfect browned mushrooms. Also butter. So much butter! Julia is an enduring spirit for us here and probably for you; she never goes out of style. (Don鈥檛 miss this New Yorker read if you鈥檙e in a mood to spend a little extra time with her today.) She still feels utterly modern in her clarity and energy; I was marveling again at the side-by-side recipe layouts of Mastering the Art of French Cooking. Why isn鈥檛 every recipe this lucid? 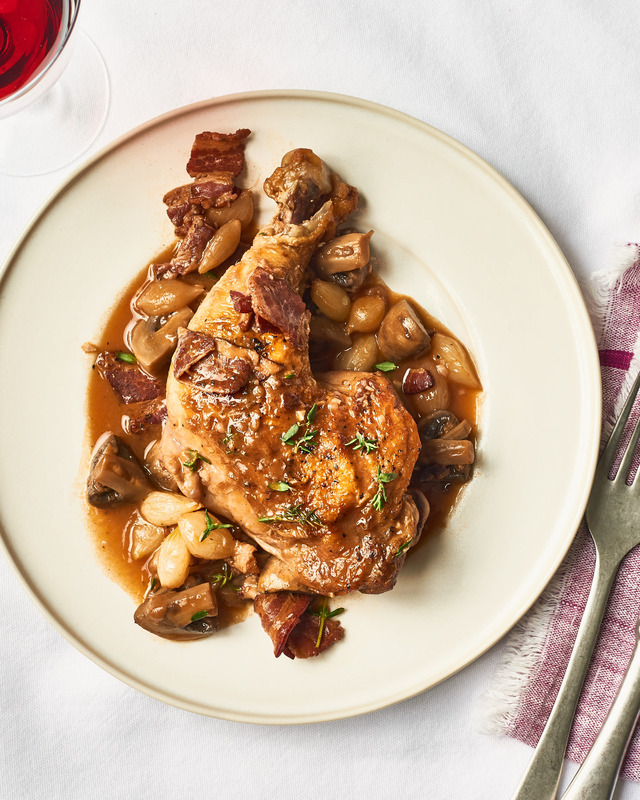 The coq au vin, one of her best-known and most iconic recipes, was a no-brainer for inclusion 鈥� it practically defines showstopper. It鈥檚 a little showy and has a French authority; but it鈥檚 still comfort food you鈥檙e not afraid to bring to the table. I mean, this is JULIA CHILD鈥橲 COQ AU VIN. Who isn鈥檛 at least a little impressed by that? It deserves every bit of its fame. It鈥檚 rustic in the best ways, heady with wine and layers of flavor. The drawback? Man, does it take time. See my full recipe review for more detailed musings (and some pointers if you would like to try this one at home). But while Julia鈥檚 recipe at first seemed like a clear winner on taste, I felt dragged down by the weight of its extravagant time and expense (Armagnac! I was so happy for an excuse to buy a bottle but that $40 burnt a hole in my budget). But is it worth making at least once in your life? By all the Armagnac in Toulouse, yes. Go slow and enjoy it. Is it the first thing that comes to mind when considering a dinner party? No, I can鈥檛 say that it does. I would rather make a pot of it slowly with no rush or pressure to set the table for anyone but my family, and hoard that good stew for myself and my husband on a greedy January weekend, with at least two bottles of wine. I don鈥檛 really want to share, especially after that much work. And yet 鈥� at the start, Julia was the front-runner on sheer taste and pleasure. Next up: another very easy choice for inclusion 鈥� Sheila Lukins鈥� Silver Palate Chicken Marbella, the darling of the 鈥�80s and beyond. This is the most on-trend recipe I鈥檝e ever made 鈥� if that trend belongs to a time other than now. Heaps of brown sugar, olives, and prunes. Enough chicken to feed a vast crowd. Simple preparation (just toss it all together!). Again, read my notes for the full review, including what I would do differently next time I made it. I see why this is such a classic, but it wasn鈥檛 for me 鈥� which surprised me. 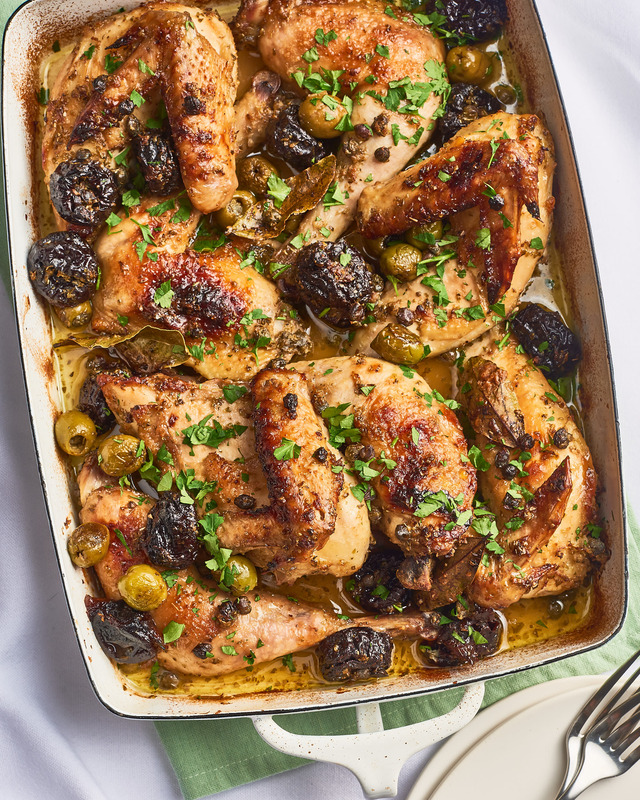 It has so many things I love: olives, capers, the ease of all those chicken parts and make-ahead magic. But I found it a little contrived and in the end, just too sweet. Even after extra time in the oven, the chicken skin was a little pallid and greasy. The balance was off. It was missing something that would make me confident in serving it. I鈥檝e already had howls of kickback from people I shared my conclusions with, so to be fair, I don鈥檛 think I can pass this by without making it again, but for me 鈥� This isn鈥檛 my favorite (in the precise enunciation of my three-year-old at bedtime). This one was also an easy pick, since I myself, with the grand confidence and hyperbole of youth, proclaimed Jamie Oliver鈥檚 chicken in milk THE BEST CHICKEN EVER, probably (no one remembers caveats on the internet). I would like to think that you, dear Kitchn readers in your avid response, had a lot to do with the way this recipe soared into a proto-viral hit. It has everything that makes for internet glory: it鈥檚 delicious, homey, but also a little weird. Chicken in milk takes some convincing. But the flavors hold up. For full notes on this one, I am going to direct you to my original piece on the topic; I stand by my first admittedly gushing response 鈥� if not the hyperbolic conclusion. It鈥檚 a wildly good chicken, with an elemental musk where lemon meets cinnamon, and gloptastic sauce that was made for thick slices of sourdough bread. It鈥檚 gorgeous and drippy and tear-it-off-the-bone moreish. But is it a Sunday showstopper for guests? Maybe the right sort of guests 鈥� someone you鈥檙e really comfortable with, who is there for you when you finally buy that Le Creuset and break up with the bad guy and rage-quit your micromanaging boss and is cheerfully game for all the right gossip. First, it鈥檚 gorgeous. A great showstopper has a certain drama at the table, whether it鈥檚 in a pot or on a platter. It doesn鈥檛 just taste good; it looks like it tastes good. Second, while the ingredient list is relatively long, it鈥檚 also surprisingly flexible and 鈥� the buzzer-beater here! 鈥� it can all be prepped ahead. In fact, the recipe demands that you combine every ingredient in one big bowl and put it in the fridge overnight. I think I prepped the whole dish in 10 minutes flat. Then you just spread on a tray and roast at very high heat. Serve warm or (this right here!) at room temperature (can you tell I love this recipe? I鈥檓 tipping my hand). Even with all that, I was a little skeptical of this one鈥檚 chances. (It had to beat Julia for flavor, to have any chance at all.) Its handicap was the fennel. 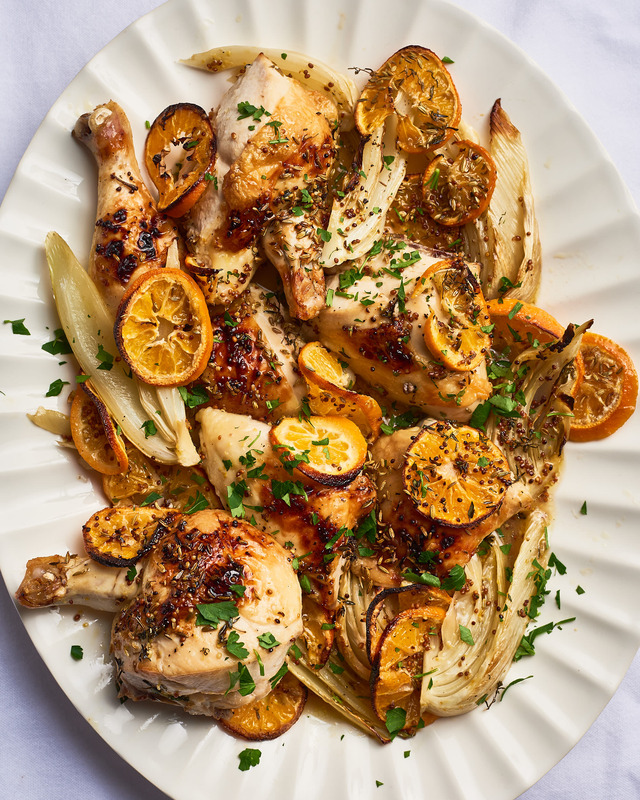 Fennel is a polarizing taste, with its green licorice-meets-celery scent, and this recipe calls for a lot of it. Fresh fennel, plus fennel seeds, plus a strong anise spirit from Israel (or a Greek ouzo, or French Pernod. Or leave it out entirely. See? Flex.). I鈥檇 wondered: Would this just be altogether too much? In the end, it was a rout; Ottolenghi all the way. It stood at the intersection of ease, crowd-pleasing flavor, and beauty. So that is my March Madness report, a really great story where a come-from-behind dark horse emerges to win. This recipe is the full package 鈥� but that doesn鈥檛 mean the other contenders aren鈥檛 great too of course. 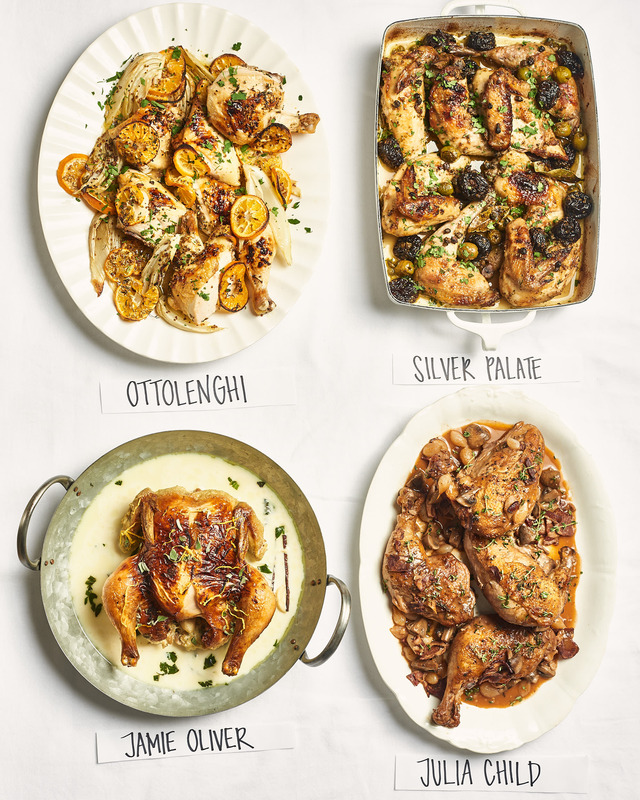 In fact, before someone shouts out from the comments, I know that chicken Marbella has many of the same virtues as the Ottolenghi chicken: one-bowl prep, make-ahead ease, a one-tray meal good at room temperature. But I just couldn鈥檛 quite get my head around the flavors. Subjective as all get out, but that鈥檚 why this is chicken and not basketball. Everyone needs a showstopper; quite likely you have one already and if so, I would dearly love to hear about it in the comments (including, if you please, the most memorable dinner it headlined). But if you are in the market for a fancy showstopper still, consider these four 鈥� especially my new favorite. By the time you read this, I will probably have made it at least once more.